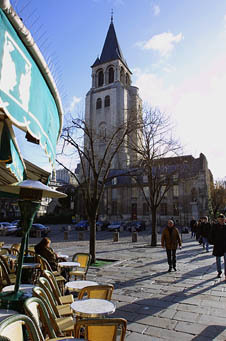 Paris' oldest church : 3, place Saint-Germain des Prés. Open every day from 8am to 8pm. Very few visitors to this church are aware that inside it hangs a small picture by Picasso depicting the head of a woman. Placed in the corner with rue Bonaparte, this small design pays homage to the poet friend of the Spanish painter, Guillaume Apollinaire. Completed in 558 and consecrated by the Archbishop of Paris, Monseigneur Saint-Germain, the church still holds today the remains of the man who ordered its construction, the King Childebert 1st, the Merovigian King building this Basicila of Sainte-Croix to hold the tombs of future kings. Repeatedly destroyed by the Vikings in the 9th century, the church was reconstructed by the Abbot Morard at the turn of the millennium. Enlarged in 1163 by the Pope Alexander III, its influence spread beyond the city limits of Paris, becoming perhaps its most well reputed parish. The French Revolution turned the church successively into a prison, a torture chamber for the two hundred odd Parisians massacred there and finally a munitions store of gunpowder. This was a fatal mistake, a fire, igniting the powder, resulting in the destruction of the church’s framework and a good deal of its treasures, including its celebrated library of theology. A large part of the Abbey that lay in ruins was completely destroyed in order to make room for the Place Saint-Germain des Près which faces the church today. The church’s current appearance can be traced to the 19th century architects, Godde and then Baltard, who both worked on restoration. 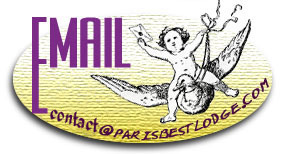 Behind the Eglise Saint-Germain, you can visit Studio Saint-Germain or Studio Mazarine.